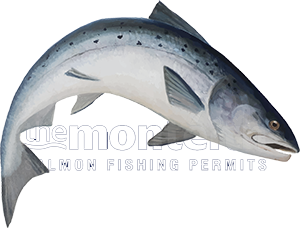 For Every £100 Of Permit Purchase Value You Book Through This Booking Platform You Will Qualify For One 'Complimentary' Salmon Fly Pattern. The salmon flies on offer are patterns that I’ve done well with in my professional career but always double check with the head ghillie that the prevailing water conditions are appropriate for the pattern & size provided. These 'complimentary' salmon fly patterns are issued in accordance to the fishing months & date ranges booked as stated on each fly pattern description and photograph when enlarged. I hope you will enjoy as much success as I've had over the decades using these patterns along with my career based salmon beat judgement for optimising their swim time. All salmon fly patterns are hand tied in Scotland by 'expert' professional salmon fly tyer Danny McLaughlin. 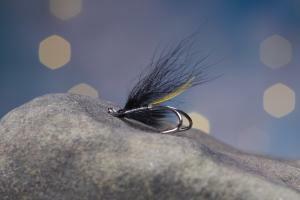 This highly successful early Spring fly pattern is technically a modern day version of the traditional 'Black & Yellow' salmon fly that accounted for thousands of salmon in Scotland during the cold water of Springtime. Additions to this fly pattern including my personal favourite gold holographic addition to the wing make it a fly that on many occasions salmon just cannot leave alone. This deadly fly pattern is tied on a copper tube just to assist in taking its flight path right onto their noses during big and very cold early Spring water conditions (15 January to 15 February). 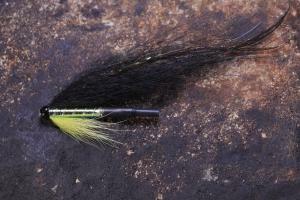 Here's the Spring aluminium tube version of this excellent salmon fly pattern. 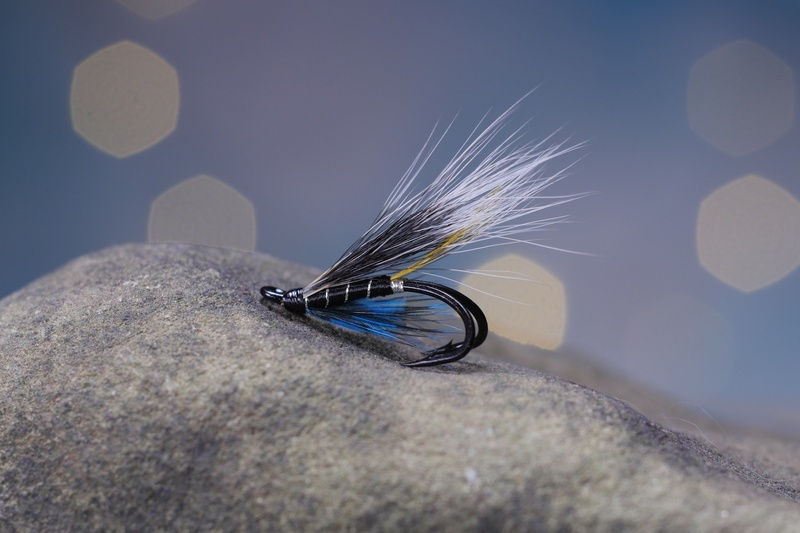 This salmon fly is a carefully designed hybrid of the deadly Ally's Shrimp 'Cascade' pattern with a few interesting & very effective additions. 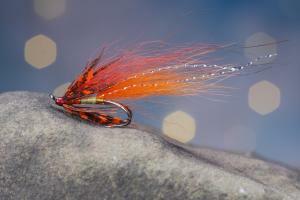 The copper body was introduced as a tribute to my late mentor and famous River Tay ghillie Willie Laird who loved a touch of copper tied into a salmon fly. The body has a 'salmon eyes only' coating of UV varnish and the two longish strands of gold holographic in the black fox wing adds an irresistible sparkle when any glimmer of sunlight is present (16 February to 31st March). 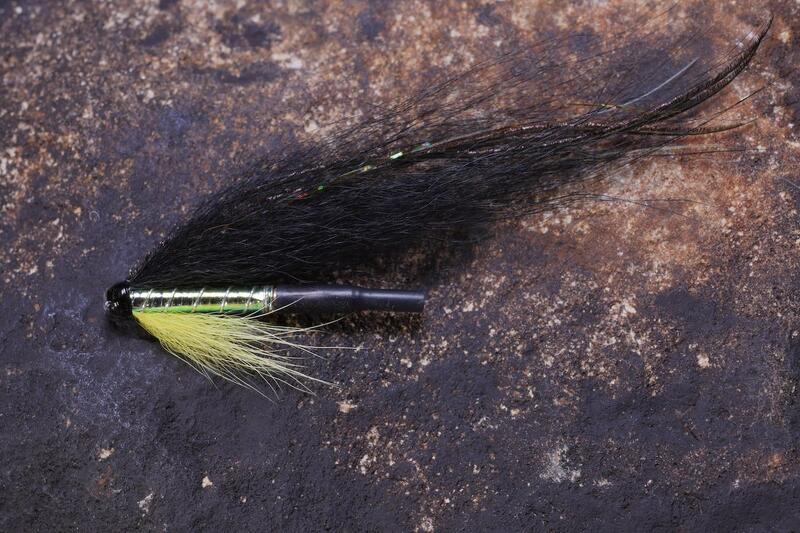 This salmon fly is a carefully designed hybrid of the deadly Ally's Shrimp 'Cascade' pattern with a few interesting & very effective additions. 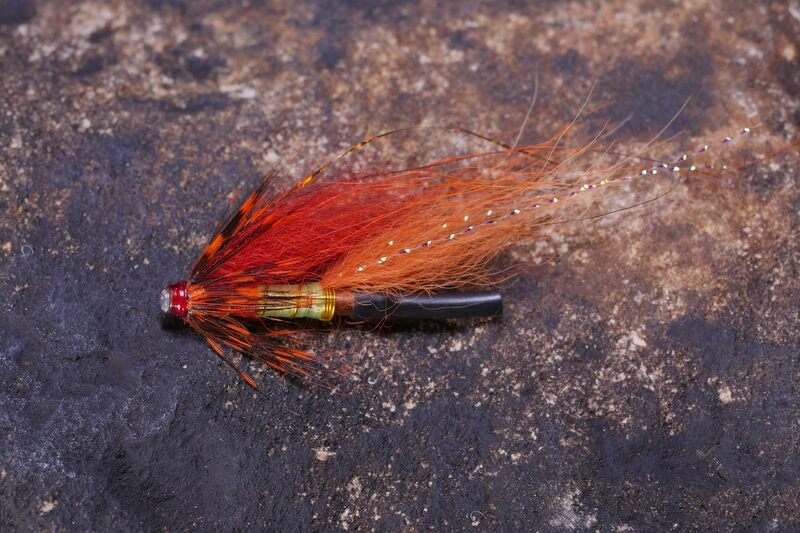 The copper body was introduced as a tribute to my late mentor and famous River Tay ghillie Willie Laird who loved a touch of copper tied into a salmon fly. The body has a 'salmon eyes only' coating of UV varnish and the two longish strands of gold holographic in the black fox wing adds an irresistible sparkle when any glimmer of sunlight is present (1 April to 30 May). 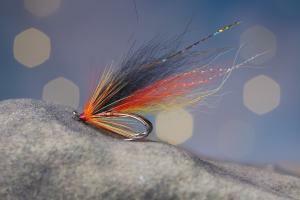 This salmon fly brings back an experience on the Tay that is special to my heart when in 1976 as an 11 year old boy I landed my first salmon for a guest from the neck of the Cottar Pool on the Newtyle Beat in June when I should have been at school. 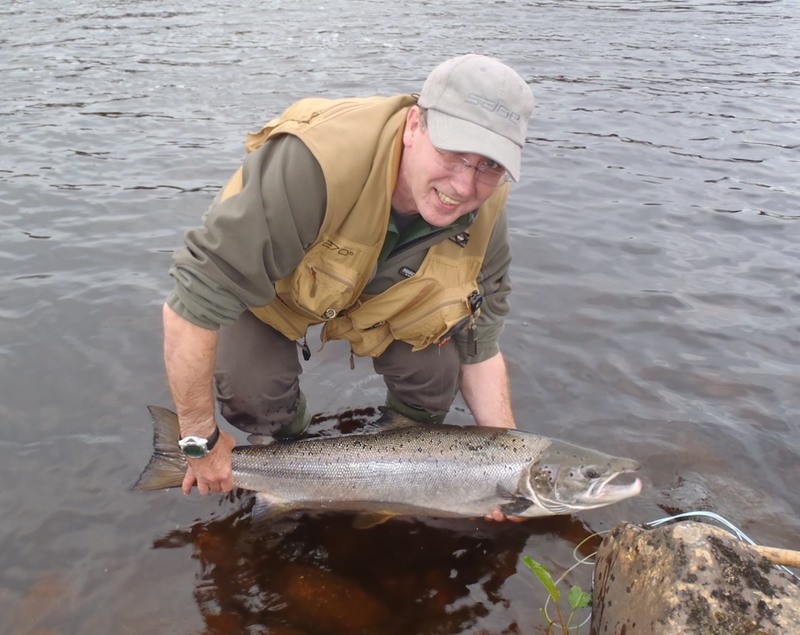 Countless salmon I've caught on this low clear water pattern in the decades since then including assisting famous UK fisherman Keith Arthur from the Sky TV's 'Tight Lines' program to his first ever salmon on the Boat Pool on the Tay's Glendelvine Beat in 2014. When salmon need a subtle approach in clear, low warm water you can bank on this highly effective fly pattern (1 June to 30 June). This salmon fly pattern goes way back to my youth which was focussed often on the prolific west coast Scottish rivers where this pattern of salmon fly was the 'only' choice. Whatever component of this fly that salmon want to investigate I have not identified but what I do know and fully understand is how often your fly line will tighten when you're swimming one. This is another highly effective fly pattern that does well in the low clear water conditions of Summer when a more subtle approach to catch a salmon's attention is required (1 July to 31 July). 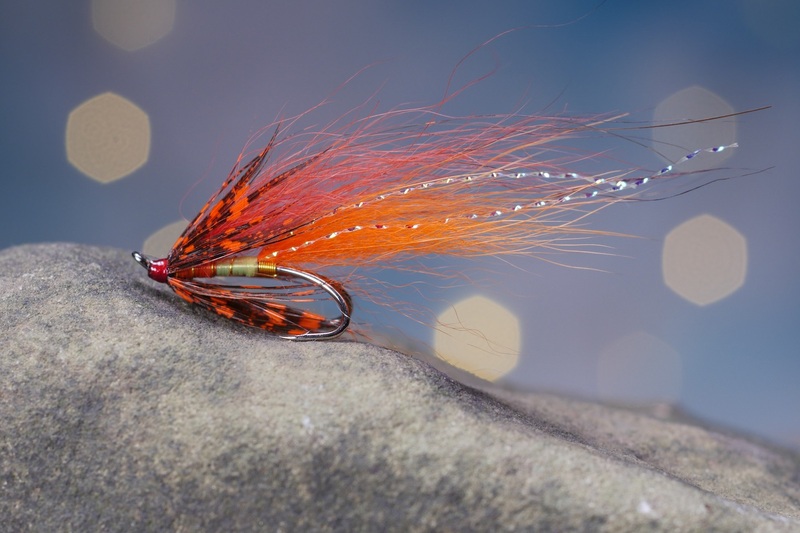 This salmon fly was designed on the River Tay in 2003 while serving as a head ghillie to specifically target Autumn salmon. The fox teasing tail pattern has an irresistible 'stream waggle' with an added sparkle of copper holographic tied into the wing. 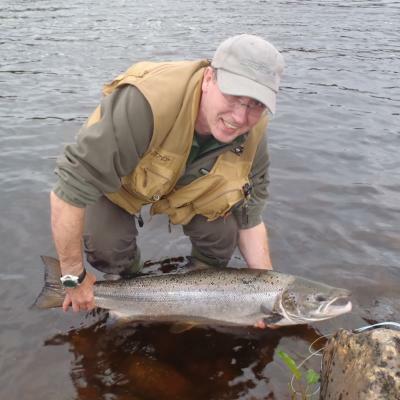 While serving as a Tay ghillie I was continually asked by many famous salmon anglers for this pattern such is its salmon alluring qualities especially during late Summer and the Autumn months (1 August to 15 September). 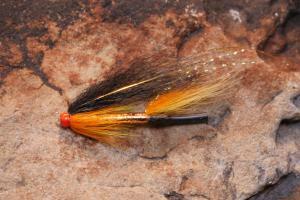 Here's the late Autumn deep swimming copper tube version of this excellent salmon fly pattern. This salmon fly was designed on the River Tay in 2003 while serving as a head ghillie to specifically target Autumn salmon. The fox teasing tail pattern has an irresistible 'stream waggle' with an added sparkle of copper holographic tied into the wing. While serving as a Tay ghillie I was continually asked by many famous salmon anglers for this pattern such is its salmon alluring qualities (16 September to 15 October).